The Estate has about 6 different basic property types but these are then subjected to a wide variety of different treatments in order to add variety to the street scene. It would have been so easy and cheaper to have built each house of the same type with the same format. Instead houses side by side can be quite different. We will look at some of these differences. These are built in 2 blocks either side of what was originally the way down to the Valley allotments and now Winterbourne Lane. The block on the left consists of 6 flats with brick and render facing. On the other side the flats have a wood pannelled front facia. Why did they not build them the same? The left block has a bridge to the upper flat upstairs front door whilst those on the right have steps to the upper front door. The flats have a shared front garden and an individual area of garden at the rear. Part of the Harborne Tenants' Estate Limited of circa 1908, by Martin and Martin. An asymmetrical block of 6 flats. Red brick and roughcast: tiled roof. Two storeys; 3 flats wide, each with a projecting roughcast gabled bay with battered sides. In the projecting bays the recessed and arched entrances to the flats, those on the ground floor slightly below pavement level, those on the upper floor reached by bridges supported on exposed steel joists. All windows casements, those of the ground floor with segmental heads. The Estate has a variety of brickwork styles from plain red brick to the variegated finish illustrated below. It would have been much simpler to have used only one type of brick throughout. This was not the case, with variation the norm, even within the same road. All this in order to add variety to the street scene. The Titford Brick Company was at Titford, Halesowen, Worcestershire. The first directors were S. Barnett (Chairman) and T. Barnett. The registered office was the Titford Brickworks, Blackheath Nr Birmingham. In 1908 ‘The Builder’ reported Messrs S. Barnett and Sons (Tipton) exhibit a number of their hard “Terra-Metallic” blue metallic paving bricks etc for footways, stables etc and also blue building bricks. At the back of the same stand “purple” bricks made by the Titford Brick Company Blackheath Staffs are shown; these are of different kinds some being of the usual size and others about 2in thick; some again are of uniform colour and others brindled but all appear to be very hard and well burnt.
" That the Company be wound up Voluntarily and that Roy Lawrence, A.C.A., of 4 Waterloo Street, Birmingham 2, be and he is hereby appointed Liquidator of the Company for the purposes of such winding-up." There is the physical evidence Titford bricks were used. However Smarts Brick Works advertised in the original prospectus and also claimed to have supplied the builders of the Estate. California is only a short distance from Harborne. The Lapal tunnel mentioned on the advert is now disused and closed off but there is a Society who has hopes of reinstating the canal from Selly Oak overland past the Weoley Castle ruins and out through the country park to Halesowen. The Titford bricks are 8.75" x 4.25" x 2.25" whilst the normal red bricks used are 9" x 4.33" x 3". Rooflights are a feature of many of the Estate properties. These are simply flat sheets of glass set below the roof tiles with lead flashing to weatherproof. They are usually over stairwells to provide additional light. Being flat and flush they are very unobtrusive compared to modern alternatives. As far as we know all the houses had an outhouse. This consisted of the outside WC and a coal store. In addition the rear roof was continued to form a small covered area. Perhaps this was for garden tools or equipment. The configuration of the outhouses is broadly similar. Often there is a passage between the rear door of the property and the outhouse with a verandah covering. Some outhouses have a side door. In 1980 our house only had the outside WC and there was no light! 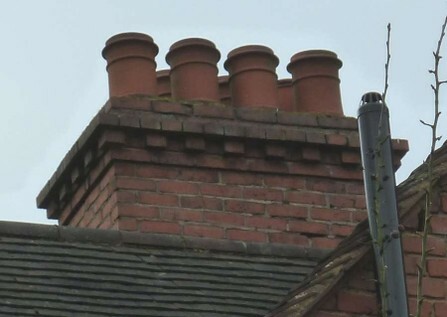 There are several distinct styles of chimney. A few have been lost and others altered in the past as the chimneys have been modified to accomodate modern eating systems. They are a distinctive aspect of the estate and protected from removal or alteration by the conservation status and article 4(2) direction. The left view shows the particularly decorative design with layers of tiles. On the right is the layered brick finish. A more appropriate description of these styles and the construction would be welcome. Harborne Tenants manhole cover. An easy to see example is at the top of the pathway by the side of the Moor Pool off Ravenhurst Road. The original letter box of which many examples still exist. The detail on the left shows the lead capped combing on a bathroom dormer. The lead is formed around the wood comb. At its rear base it meets the horizontal lead dormer covering. Most of these cappings have been lost and replaced by cheap bitumen felt coverings and so are now a rarity. The roof tiles are now at least over 105 years old (2017) but despite this remain in serviceable condition. 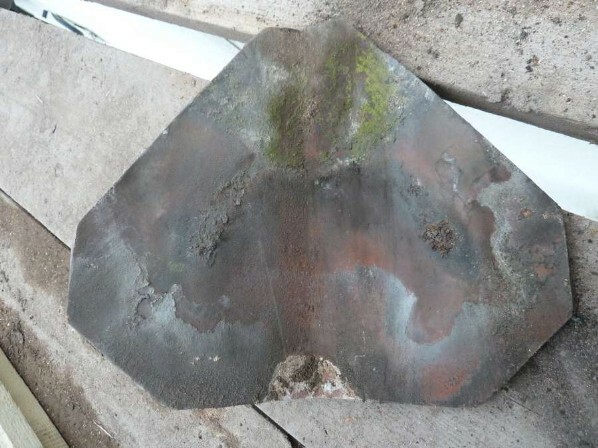 Roofs that are relaid should use the original tiles with any breakages replaced in non-visible locations. A few roofs are slate and again these should be replaced with the originals. If in doubt sek advice from the conservation department of Birmingham City Council. The standard small tiles are 11.25" x 7" and are marked 'Paragon' and 'Hand Made'. The larger tiles are 10.25" x 10" wide. The are marked 'R, Hand Made and A'. Any further information on the maker would be appreciated. Hand made tiles are more irregular in shape and finger marks are sometimes visible where the nibs are pushed over by the makers fingers. 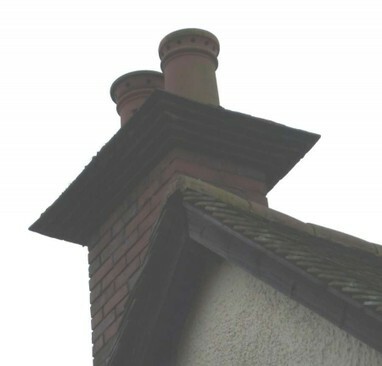 The picture shows the water spout fitted to a bay window. The water is collected in a shallow channel near the perimeter of the window and fed into the spout which is lead soldered in situ. The soldering here is probably not the original.